Happy Friday! Earlier this week my order from the Halogen x Atlantic-Pacific collection arrived in the mail and I was beyond excited about it. I took to my instastories to show some of what arrived and polled viewers as to whether they would like to see an honest review about the collection, including sizing information, thoughts on the fabric and quality, etc. Let me tell you, I did not expect the response I got. The yes / no poll had 100% response rate for yes. … one hundred 100%!! Anyway – back to the Halogen x Atlantic-Pacific collection review! For those of you who may not know what this is, let’s start with the basics. What is the Halogen x Atlantic-Pacific Collection? 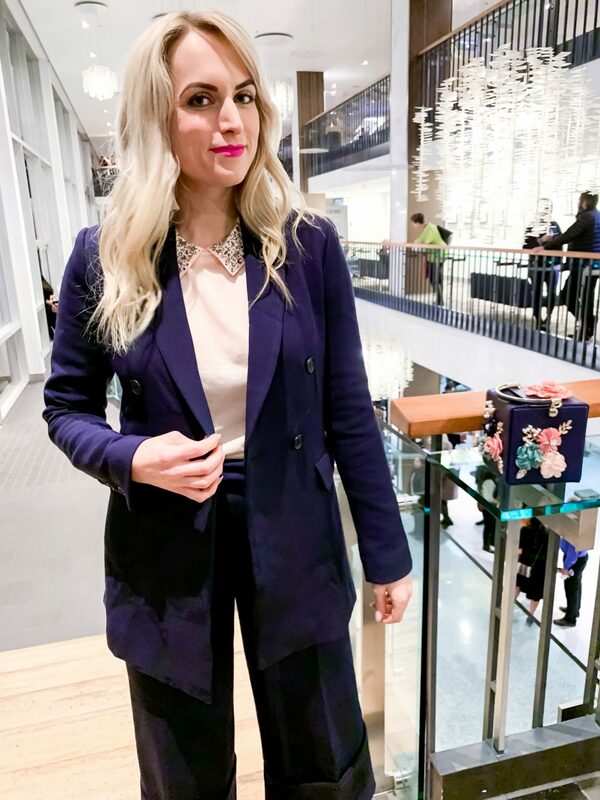 Fashion blogger Blair Eadie teamed up with Halogen (the in-house brand at Nordstrom) to design a collection. Blair is best known, style wise, for her love of color and her layering skills / layered fall outfits. The collection launched last Monday October 22nd at Nordstrom online and select Nordstrom stores. Everything was produced at once, meaning there will be no restocks. Once an item is gone, it’s gone**. Note: there is an exception to this- I’ll talk about it below. The hype around this collection has been huge. People are loving the fact that the clothes are versatile match-with-each other pieces, and that the price point (especially by Nordstrom standards) is reasonable. The majority of pieces are in the $100-200 range (not including accessories). First off let me be clear – I will always give you my honest opinion on products. Even when something is being presented to you as a ‘sponsored post’ I want to make it very clear that what a brand/company is paying me for in that situation is a review. They are not paying for a good review. My opinions shared are always my own. For this collection though (because I know readers do want to know) I can advise that I have not been compensated for my review; nor were the clothes/items gifted. Everything I am sharing I purchased with my own money! Fabric / Quality: The fabric is so different than I expected! Unlike your typical blazer it is really soft and matte (so many blazers have a shine- you know what I mean?!) The blazer is mostly polyester and rayon, but I just love the soft, stretchy and heavy (in a good way) fabric. Size: The blazer does run large. I wear a S/M, brand depending, and went with a small in this blazer. It is still a touch big. Definitely size down in the blazer! Overall: 3.5/5 stars. I like it for all the things mentioned above. What I don’t like is that if you are long-waisted like I am, it likely won’t sit well when it’s done up. It just hits me at a weird spot and makes me look wider than I am. Not fun. That said, I still like it and would recommend it; I’ll just be wearing it open only. Fabric / Quality: Same as the blazer (clearly). I love this fabric! Overall: 4/5 stars. I love these pants! The wide cuff is gorgeous and they nip in perfectly at the waist line, which is important when dealing with a looser/wide leg fit. Fabric / Quality: I am so impressed with the quality of the shoes in the Halogn x Atlantic-Pacific collection. Every inch of this shoe is well made. Even the heels of the shoes are the softest almost suede like material. The one thing to note – with both pairs I ordered, on the right shoe of each the strap came out of the box ‘bent’. When you look at the shoes you can see it, but the strap does sit completely fine when actually on; so it’s not a problem at all. Just something to note! Size: These do run small!!! I wear a 9.5 usually. I got the rose glitter ones in a 9.5 and the black in a 10. The 10 fits way better. 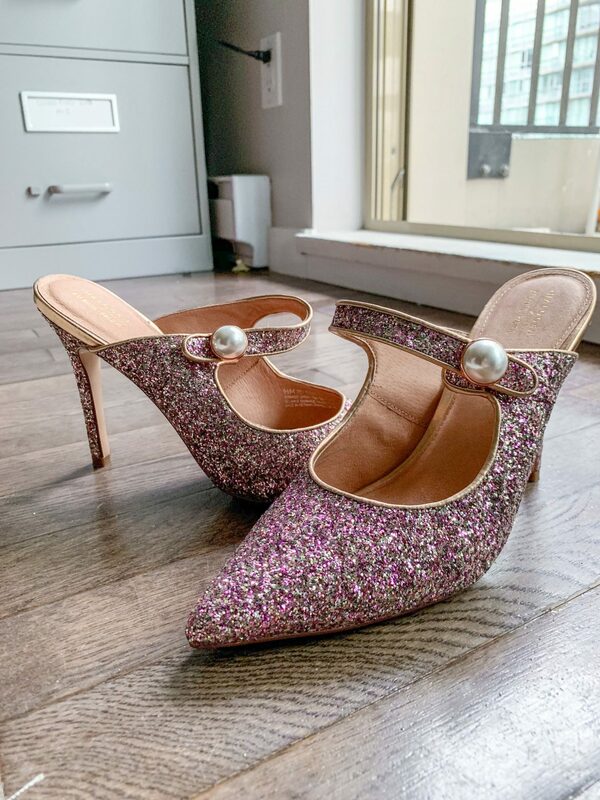 Because they are mules, I’m still going to wear the rose glitter – and you can definitely get away with them being a bit small, but size up a half size if you can. Overall: 5/5 stars!! These shoes are amazing. And for the price? I am blown away. Fabric / Quality: The tweed is so beautiful in person. The bow is also a beautiful velvet. 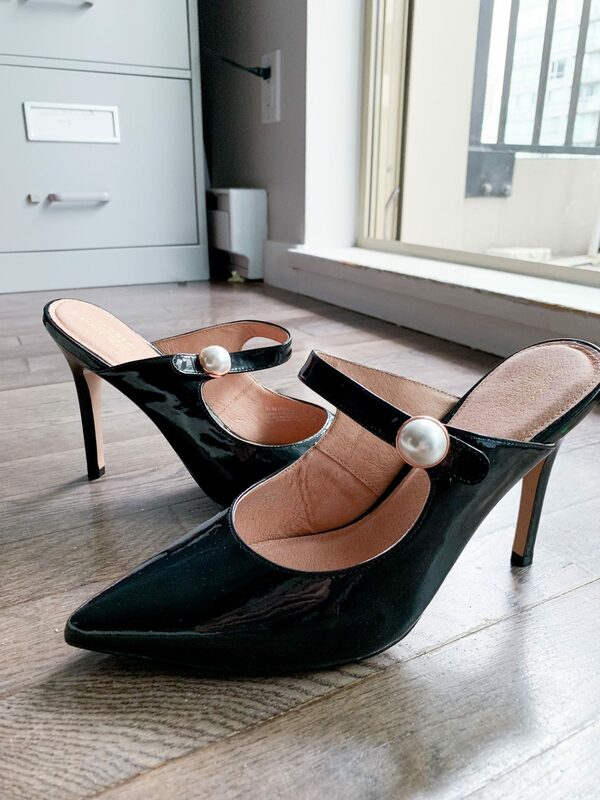 The pump itself is well cushioned and seems (haven’t had the chance to wear them out of the house yet) like they will be incredibly comfortable. Size: Again I would size up a half size in these pumps. I got the 10 and they fit perfectly. Overall: 5/5 stars. I love these. I will probably order them in the black suede now as well. Fabric / Quality: Nothing stands out about the fabric quality; either good or bad. Size: These fit true to size. I got a 9.5. Colors: Black & Rose Glitter. Overall: 3.5 /5. I do love these, and will wear them a ton at the officd. Depending on your budget though, I’m not sure I’d spend $120 again for these since they are a more typical looking shoe (I’ve seen similar flats). If you have the budget though, then they are a good investment! Click on the images below to shop any of the pieces I reviewed above! How Can I Get Sold Out Halogen x Atlantic-Pacific Items? As mentioned, the collection was a capsule one; meaning product will not be restocked. That said, because product was shipped out the individual stores (the select few) that were carrying it in store; there may be pieces that are not reflected when looking at the Nordstrom website. So, if there is a particular piece you wanted that is no longer available, or no longer available in your size, give some stores a call and ask if they have it. If they do you can ask to purchase it and have it sent to your nearest store for pick-up. The second way you can get your hands on any sold out pieces – refresh, refresh, refresh! Since people were terrified of items selling out, on launch morning a ton of people ordered items in two sizes, with a plan on returning whichever didn’t fit. As returns come in, the Nordstrom website will be updated, so if there’s something you really have your heart on, just quickly refresh and check the Nordstrom site whenever you can. You may have luck and be able to get it! Anything I missed in this Halogen x Atlantic-Pacific review?! Let me know in the comments below and I’ll answer them! "Color Combination for Fall – Black & Camel"
I’m a big fan of this collection and bought a few stuff! I loved hearing your honest thoughts on the pieces! I do agree that those pants are amazing! Isn’t it such a great one! I am thrilled with it. Glad you got some things too! The only thing I really, really wanted that sold out before I could get it was that beautiful pink bow front blouse! I love that bloggers have started creating collections! And it’s even better when fellow bloggers support and give honest reviews! I can see why you gave those tweed pumps 5/5 .. GORGEOUS! Exactly! Normally I would have felt very guilty spending as much money as I did here all at once, but honestly I felt zero guilt at all because I genuinely love the idea of supporting another fashion blogger. I love, love, love that blazer and these shoes. I would do anything to own those. They are divine. Aw thanks Megan!! Theyre still available on the site! I love the tweed shoes! Thanks for the review. You’re so welcome!! Thanks for reading it! Those pants are so adorable! Love! I love her new pieces! Those shoes are favorite! This is the only influencer collection I’ve found myself excited about! I love that it’s size inclusive and has such a wide range of items. The color-blocked pleated midi skirt is on my wishlist, and now that I’ve seen those glittery mules and tweed pumps I need them too!! Love your detailed reviews. It was sooo well done for sure. And i totally agree -the size inclusivity and the affordable price points really made me love it as a collection. Girl you are rocking her pieces! Adore those shoes. have been seeing this collection all over instagram. I am loving quite a few of her pieces. I’ve heard suchhhh great things about this collection! I can’t get enough of the shoes!!! Right!? The shoes are amazing. I do like the whole collection, but the shoes are really incredible. I love all the shoes! Good idea to go up a half on the mules. I definitely keep refreshing because my favorites sold out immediately!! Ah I hate that! did you get the pink bow blouse?! I hope you did because that shirt was MADE for you!! You scored some great pieces!! I am obsessed with all of my pieces that I got from her collection with Halogen! Thanks Laura!! I just saw the pale blue top of hers you styled on your blog today- it looks amazing!